a given type of macromolecule is not "seen" by neutrons or is contrast-matched. Experiments have shown that the neutron scattering of protein is matched by 40 to 42% D2O, whereas RNA is not "seen" by neutrons in 70% D2O. Correspondingly, measurements of the radii of gyration of ribosomal subunits in 42% D2O yield values only for ribosomal RNA in situ, while measurements in 70% D2O give the radius of gyration of the total protein component of the particle. In the case of E. coli 50S ribosomal subunits, these values were found to be equal to 65 A and 100 A for RNA and protein, respectively (Fig. 8.1). In other words, the RNA is located preferentially at the center as a core, while protein, on average, occupies a more peripheral position. In the case of the 30S ribosomal subunit, this difference is less pronounced - 65 A and 80 A for RNA and protein, respectively. This smaller difference is understandable since the 16S RNA, despite its lower mass, has a less compact shape or is less isometric than the 23S RNA of the 50S ribosomal subunit. Furthermore, some protein material may be located between the lobes (branches) of the 16S RNA in the 30S ribosomal subunit. The RNA core in the ribosomal subunit seems to be dense, i.e. the extent of RNA folding in situ is high. It follows from the value of the radius of gyration and the scattering curve that the volume of RNA in the 50S subunit is equal to only 2 x 106 A3. This value is only twice as much as the "dry" volume of RNA. A similar conclusion has been made for 16S RNA in the 30S ribosomal subunit. Therefore, the density of RNA packaging in the ribosomal particle is approximately equal to that found for the crystalline packaging of hydrated RNA helices or tRNA. After the core position of ribosomal RNA is determined, elucidation of protein distribution on the surface of the particle, i.e. of protein topography, becomes the next crucial step toward the quaternary structure of the ribosome. A large number of experimental approaches to the study of protein topography have been developed. These approaches will now be discussed using the E. coli 30S ribosomal subunit as an example. Some information regarding protein neighbors can even be taken from the data on protein binding sites upon the primary and secondary structure of ribosomal RNA (see Section 7.5 and Fig. 7.6). Indeed, if the binding sites of proteins on rRNA are located close to each other, it is clear that these proteins are neighbors in the ribosome. For example, the previously discussed proteins S8 and S15 recognize and bind adjacent sections of the chain and adjacent hairpins in the secondary structure of 16S RNA (see Fig. 7.7); therefore it may be concluded that proteins S8 and S15 are neighbors in the topographic sense as well. Their neighbors are proteins S6 and S18, which for their binding require the preceding binding of proteins S8 and S15 (Fig. 7.9) and have the recognition sites in the same region of the RNA sequence (Fig. 7.6). 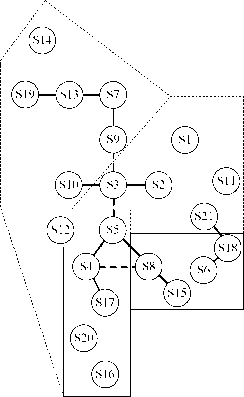 Another example of a group of neighboring proteins includes proteins S4, S16, S17, and S20 which are located close to each other on the 16S chain within domain I (Fig. 7.6). Figure 8.2. Scheme showing proteins neighboring in the 30S ribosomal subunit. Proteins connected by a solid line are crosslinkable with a short reagent (most direct contact); those connected by a broken line are crosslinkable with longer reagents. The proteins in a solid-line box have adjacent binding sites on the ribosomal RNA sequence. The three groups of proteins within the broken-line boxes correspond to the three RNA domains and the three particle lobes. The ester groups of such a reagent are effectively attacked by the e-amino groups of lysyl residues present in ribosomal proteins, resulting in the formation of amidine bonds instead of ester bonds. Using reagents of a different length, e.g. dimethylsuberimidate (n = 6) or dimethyladipimidate (n = 4), permits a rough estimation of the distance between neighboring proteins. Pairs of proteins crosslinked in this way are isolated, the disulfide bonds reduced, and individual proteins identified electrophoretically. The summary of the results on protein crosslinking in the 30S ribosomal subunit of E. coli is schematically illustrated in Fig. 8.2. Circles connected with lines designate crosslinked proteins; groups of proteins neighboring on RNA are boxed. The problem of the mutual arrangement of proteins in the ribosome may be solved even more comprehensively by measuring the distances between the proteins. These approaches are not limited to determining the nearest neighbors. Technically, however, these approaches appear far more complex. The most informative approach to measuring the distances between ribosomal proteins is based on the use of neutron scattering by ribosomal particles containing selectively deuterated pairs of proteins (Engelman et al., 1975). Since protonated and deuterated proteins exhibit different neutron scattering, comparing the scattering of correspondingly unlabeled and labeled ribosomal particles allows the contribution of the deuterated pair to be distinguished and used for estimating the distance between mass centers of the two proteins, as well as the degree of asymmetry (or compactness) of each of the proteins in situ. In selecting the solvent composition (proportion of H2O and D2O) in order to match the scattering of protonated proteins, one can further increase the apparent relative contribution of the deuterated pair. Using measured distances between mass centers of proteins in numerous deuterated pairs, the method of triangulation can be exploited in constructing a model of the three-dimensional arrangement of ribosomal proteins in the E. coli 30S subunit (Fig. 8.3). These results provide one of the most accurate and fundamental contributions to our knowledge of the arrangement of proteins in the ribosomal particle. The above approaches provide evidence of the arrangement of proteins with respect to each other but without reference to the morphology of the ribosomal particle. The use of electron microscopy for visualizing proteins on the ribosome allows the location of a protein on a morphologically visible contour of the ribosomal particle to be determined (Wabl, 1974; Lake et al., 1974; Tischendorf et al., 1975); combined with the above data, this provides an opportunity for superimposing the entire network of protein topography (Figs. 8.2 and 8.3) on visible projections of the particle. Electron microscopic visualization of proteins on the ribosome makes use of specific antibodies against individual ribosomal proteins. The bivalent antibody bound to a given protein may interact with two identical ribosomal particles, yielding their dimer through the bridge of the antibody molecule. By observing dimers under an electron microscope, one may identify sites on the surface responsible for the joining; these sites correspond to the localization site of a given protein on the surface. In a number of cases, provided the resolution is sufficiently high, one can directly see the attachment of the Y-shaped antibody molecule to a certain region on the ribosomal surface. Using this approach, it has been established that protein L7/L12 forms the lateral rodlike stalk of the 50S ribosomal subunit, protein L1 is located in another lateral protuberance (side lobe) of the 50S subunit, and the 5S RNA-protein complex is detected in the central protuberance, or head, of the 50S subunit (Fig. 8.4). Great efforts have been made to localize all of the proteins of the E. coli 30S ribosomal subunit. Despite the feasibility of obtaining specific antibodies against each of the 21 individual proteins, the task was far from simple and the technique yielded many false localizations. It should be pointed out that this method, which appears so direct and illustrative, may result in artifactual information due to the insufficient purity of antibodies, the nonspecific binding of antibodies to certain regions of the ribosomal surface, distortion of the specific position of the antibody molecule on the ribosome caused by the orientation of the ribosomal particle on the substrate, etc. Nevertheless, some reliable results have been obtained. They are schematically summarized in Fig. 8.5. Generally, it was demonstrated that proteins S3, S7, S10, S13, S14 and S19 are localized on the head of the 30S subunit. In more detail, proteins S13, S14 and S19 were detected at the top position of the head, whereas protein S3 and S7 were located below this group of proteins, near the groove separating the head from the body, but on two opposite sides. Protein S5 was localized even lower, also close to the groove but on the body of the subunit. Proteins S6 and S11 were localized on the other side of the 30S subunit, i.e., on its side bulge or platform. Protein S8, according to the data provided by immuno-electron microscopy, is also located near the side bulge, somewhere between the bulge and the body. Figure 8.3. Three-dimensional arrangement of proteins in the 30S ribosomal subunit of Escherichia coli, as determined by neutron scattering technique. 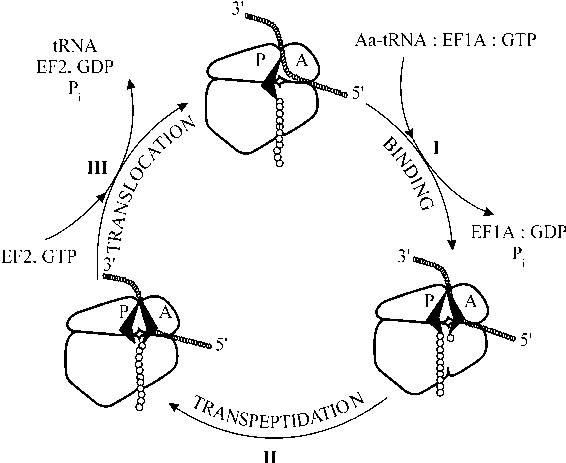 A: Triangulation of some proteins present in the 30S ribosomal subunit, on the basis of neutron-scattering data (P.B. Moore, J.A. Langer, B.P. Schoenborn & D.M. Engelman, J. Mol. Biol. 112, 199-234, 1977; P.B. Moore, M. Capel, M. Kjeldgaard & D.M. Engelman, in "Structure, Function, and Genetics of Ribosomes", B. Hardesty & G. Kramer, eds., p.p. 87-100, Springer-Verlag, New York). Figures at the lines connecting the protein positions indicate the distances measured between the protein mass centers, in angstroms (not all pair-wise distances are given). B: Map of three-dimensional disposition of proteins in the 30S subunit deduced from the triangulation data (M.S. Capel, D.M. Engelman, B.R. Freeborn, M. Kjeldgaard, J.A. Langer, V. Ramakrishnan, D.G. Schindler, D.K. Schneider, B.P. Schoenborn, I.Y. Sillers, S. Yabuki & P.B. Moore, Science 238, 1403-1406, 1987). Proteins are approximated by spheres whose volumes correspond to the volume occupied by the corresponding anhydrous protein.